Earliest Appearance Listed in This Database: Acta Academiae Theodoro-Palatinae (vol. 5) (1784): "Sur quelques zoolithes du cabinet d'histoire naturelle de S.A.S.E. palatine et de Baviere, a Mannheim"
An unnamed pterodactyl was loosed by Lex Luthor from his sea-based city so it could attack Clark Kent and Lois Lane in an approaching chartered plane. 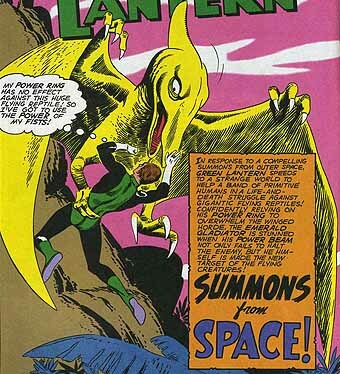 The pterodactyl was one of numerous prehistoric "monstrosities" recreated by Luthor in his biological laboratories in the city. The pterodactyl destroyed the airplane, killing the unfortunate pilot. Clark Kent lept away carrying the unconscious Lois Lane. 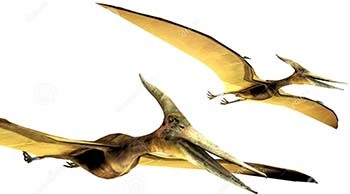 The pair was seized mid-fall by the pterodactyl. Clark Kent fought the soaring dinosaur and managed to knock it out or kill it. The conflict between Clark Kent (Superman) and the pterodactyl took place in 8 panels on pages 7 and 8 of the story retroactively titled "Luthor's Undersea City" in Superman #4 (Spring 1940). Acta Academiae Theodoro-Palatinae (vol. 5) (1784): "Sur quelques zoolithes du cabinet d'histoire naturelle de S.A.S.E. palatine et de Baviere, a Mannheim"
Judomaster #98 (Dec. 1967): "The Isle of Dragons"